This is my Husband Drawer. My husband didn’t care that much one way or the other about cloth diapers, but he was reluctant to actually change a diaper, and didn’t want to actually put any effort into learning about the different diapers. He was worried (and I was worried) he’d forget to put a cover on with a fitted, or he’d use a cover alone instead of a pocket diaper, and it made him less than enthusiastic about the whole process. So I made the Husband Drawer. It had a few prestuffed pockets and a few all in ones, and a small pile of wipes. I kept it stocked at all times. This is a good solution of your Husband problem lies, not so much in actual reluctance to allow cloth diapers into the house, but just in the diaper changing department. Disposables feel fool-proof (they’re not); cloth seems weird and confusing (it’s not). But what if your husband problem is more that your husband doesn’t want to use cloth diapers at all? Many families find that they can compromise. First, I’d encourage you to actually consider how much diaper changing your husband does (or will do). In our house, 90% or more of diapers are changed by me. If my husband were going to really be difficult about it and absolutely refuse to touch cloth diapers at all, that wouldn’t have dramatically impacted my life much. Some women find that they’re ok with simply completing all or most diaper changes themselves, and those women typically find that their husbands eventually get on board as long as they don’t nag or push. It’s also possible to use a combination of cloth and disposable. If your husband doesn’t want to use cloth, he can use disposables when he completes diaper changes (and you can put baby in a disposable if you’re leaving the house and dad will be with the baby). 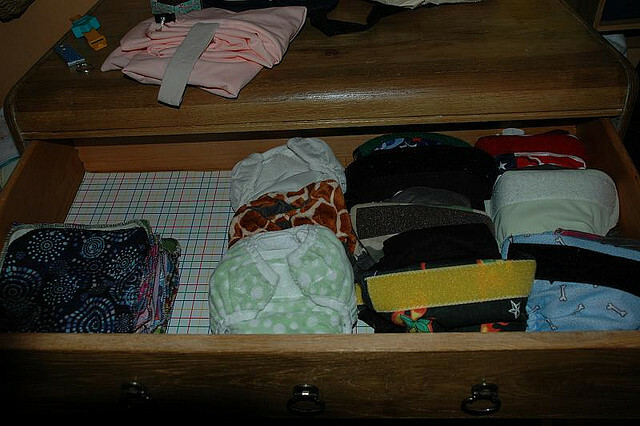 And you can use cloth when you complete diaper changes. If dad works during the day, you can use cloth during that time (whether at home or at daycare) and switch to disposables at night. This combination approach makes everyone happy and still saves you money on diapers. If the main problem is that dad just doesn’t want to have to deal with poop… well, poop is a part of life with babies. There’s no avoiding it, regardless of diaper type!! Previous Previous post: How do we get used to the carrier? or, I think my kid hates this!